2015 – The year that active managers strike back? CNBC – Can anything save active management? So what do I think? I think that there are several good reasons to believe that active management will bounce back in 2015. For the last few years equity markets around the world have exhibited low levels of volatility and dispersion, both of which make it much more difficult for active managers to beat the market. Volatility provides active fund managers with the opportunity to buy stocks at pessimistically depressed prices and to sell stocks at optimistically inflated prices. A high-level of dispersion means that the potential reward (or penalty) for picking one stock over another is greater. Volatility and dispersion are likely to increase once central banks begin to reverse their accommodative monetary policy. This should, all other things being equal, lead to better conditions for skilled active fund managers. Just what is an “active manager”? Should we measure the success or failure of active management over a one-year or even a three-year period? Is it really underperformance if an active fund manager has made a deliberate decision not to invest, or to reduce the amount invested, because the potential rewards for investing are low and/or the potential risks are high? First, the sad truth is that most fund managers who claim to be active managers are really anything but (see my post Beating the Market Part 3 – “Sheep Get Slaughtered”). According to Antti Petajisto and Martjin Cremers (quoted by CNBC in Can anything save active management? ), the researchers behind active share*, there are very few fund managers that deserve that the title “active”. Only a handful of mutual funds differ from their benchmarks enough to have a high active share and to be considered by experts to be truly actively managed. Cremers said for large cap funds, only about 12 percent of the assets in retail mutual funds is in funds with an active share above 80 percent, meaning that their assets differ by 80 percent from their benchmark. For small cap funds, about 30 percent of assets in retail mutual funds is in funds with an Active Share above 90 percent, and about 72 percent is in funds with an Active Share above 80 percent. Unfortunately, the presence of a large number fund managers with a low active share (often described as “closet indexers”) is one reason why the performance of active management appears to be dismal. Remove the closet indexers, and an investor’s probability of beating the benchmark over the long-term improves substantially. Second, anyone who expects any active manager, even the very best active manager to out-perform the market every year or in any given year is deluded. Active management simply does not work that way! For a detailed explanation, please see my earlier posts Beating the Market Part 2 – Short-Term Under-performance and Are institutional investors any better at dealing with short-term underperformance? Readers of my blog may remember the story of Walter Schloss (Getting paid a bonus for…). Schloss earned a gross return of 21% per annum over 46 years for his clients. The net return was 16% per annum, compared to 10% for the S&P 500. A $10,000 investment in the S&P 500 would have grown to over $900,000, while a similar investment with Schloss would have grown to approximately $11,000,000! 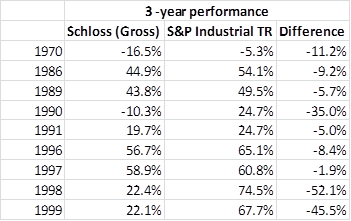 Despite such fantastic long-term returns, Schloss experienced 9 rolling 3-year periods where he under-performed the market – the worst of which were the three years prior to 1998 and 1999 where he underperformed the market by a massive -52.1% and -45.5%! Should investors have been concerned? No. Schloss’ rolling 3-year performance in 2000 was 78.2%, while the rolling 3-year performance of the market was 5.3%. In 2001, his rolling 3-year performance was 57.6%, while the rolling 3-year performance of the market was -26.0%! I cannot emphasize this point enough. The returns to active management are cyclical. This must be the case, as I have explained in a previous post. Investors who can’t be patient or who have little tolerance for under-performance relative to a market benchmark over the short-to-medium-term should invest in index funds. Third – Active fund managers are hired to assess the prospective returns on offer and the risks that investors will have to take to hopefully earn those returns. With that in mind, should investors complain if, after assessing the potential risks of an investment, a fund manager decides not to invest because the prospective rewards aren’t large enough to justify the taking these risks? After all, isn’t this exactly what they’ve been hired to do? The US share market is currently trading at elevated long-term valuation levels **. Several fund managers, in particular value managers, are struggling to find opportunities to invest in where the potential return on offer justifies the risk. For example, here’s a quote from Business Insider – Stock-Picking Fund Managers Are Having Their Worst Year In 3 Decades which cites the experience of the Yacktman Fund. In 2014, some recurring bad market bets were made by various active managers. Holding too much cash was one. Yacktman’s Subotky said high stock prices made him sceptical of buying new shares, leaving him with 17 per cent of the fund’s holdings in cash while share prices have continued to rise. He cautioned investors to have patience. “Our goal is never to capture every last drop of a roaring bull market,” Subotky said. $US10,000 invested in the Yacktman Fund on Nov. 23, 2004, would have been worth $US27,844 on Nov. 25 of this year; the same amount invested in the S&P 500 would be worth $US21,649, according to Lipper. Investors in the Yacktman fund with a long-term horizon have experienced good results, even after subtracting the fund’s 0.74% annual management fee. Now I don’t know much about the Yacktman fund but the fund’s website explains that. Yacktman Asset Management maintains a long term horizon and uses an investment philosophy focused on valuation, bottom up stock selection, and protecting and growing capital. Now the fund’s 17% cash holding makes more sense. It’s probably not an “unusually bad bet” as the article would have us believe, but rather a logical decision that’s consistent with the fund’s stated investment objectives to reduce the risk of a loss of capital by reducing investment in an over-valued market. No wonder there are so many closet index funds. There is little mercy for short-to-medium-term under-performance by actively managed funds, even if long-term performance of these funds is excellent. What’s more, the Yacktman Fund is very transparent about its focus. Nowhere has it promised to out-perform the market over the short-to-medium-term. Instead it has promised investors that it will invest with a long-term focus, which will inevitably lead to difference in performance between the fund and the market. We think our investment approach works over a full market cycle, and fits well for long-term investors who do not focus much on the short-term comparisons to a benchmark. We think risk management is important and that investors should focus on how a firm manages risk over time. Ultimately, how investment results are achieved is almost as important as what results are produced over time. It is ironic that the media bemoan the poor performance of active fund managers without acknowledging that they are, at least in part, responsible for the pressure on active fund managers to avoid short-to-medium-term under-performance. Anyway let’s get back to volatility and dispersion and why changes to both might improve the fortunes of active fund managers. Research suggests there’s a link between dispersion and active fund manager performance. In their paper Dispersion: Measuring Market Opportunity, Standard and Poors found that that the performance difference between strongly performing (top quartile) and poorly performing fund managers (bottom quartile) gets wider when the level of dispersion is high. This doesn’t necessarily mean that a higher proportion of active fund managers will beat the market during periods where dispersion is high. In fact, the evidence suggests that this is not the case. Rather, a high-level of dispersion means that the potential reward (or penalty ) for active management is greater compared to periods when the level of dispersion is low. In other words, it is a measure of the size opportunity for active management to beat the market and not the likelihood that it will beat the market. Volatility, dispersion and correlation are related. The Standard and Poors Indexology blog explains the relationship between the three variables in its post An Immediate Risk Measure. The first point explains that dispersion is a measure of the “diversification benefit”. This diversification benefit is not static as the following example will hopefully illustrate. Company R and Company F are mining companies. Company R is a large, low-cost producer with economies of scale. It has a relatively low-level of debt and earns a return on capital greater than its cost of capital. Company F is a medium-size, high-cost producer that is investing heavily to achieve economies of scale. It has a high-level of debt and only earns a return on capital greater than its cost of capital if commodity prices are high and interest rates are low. Company F has a higher operating and financial leverage, in other words, it may do better than company R if interest rates fall and/or if commodity prices rise. Conversely, it will probably do a lot worse than company R if interest rates rise and/or if commodity prices fall. A period of low interest rates and/or high commodity prices will disguise the differences in operating margins and debt levels between the two companies. Both companies will be profitable, even though the two companies are very different. Thus the dispersion, or the difference in the volatility of returns of the two companies, will be lower. All other things being equal, higher interest rates and/or lower commodity prices will exaggerate the differences in profitability between the two companies. So what’s the point of this example? The potential difference in the investment return due to picking Company R over Company F or vice versa is not static. Under certain market conditions, it won’t make much difference which company an investor picks. If dispersion is low, then the potential benefit (or penalty) that comes from discriminating between the stock of one company and the stock of another company is reduced. The example above is one of many possible scenarios that could result in a change in the level of dispersion between two or more stocks. Obviously the factors that drive dispersion will vary depending on the industry sector involved. However, the level interest rates is a factor that effects the valuation of every stock in the market. A low interest rate reduces the risk that highly-geared companies will fail because it reduces their interest repayments. just as a high tide floats all boats, low interest rates help to improve the profitability of all companies, in particular those with the most debt. Naturally, if all companies – and in particular highly indebted companies – are more profitable due to lower interest rates, then the volatility of company earnings will be lower. Consequently, the volatility of the stock market, which prices stocks based on their future earnings prospects, will also be lower. Most importantly, low interest rates also increase investor appetite for stocks as the returns available on other investments are lower, effectively forcing investors looking for a certain level of income to invest in shares rather than other assets such as bonds. Interest rates have fallen in the US for the last 30 years. In recent years, unprecedented intervention by the central banks of several major economies has seen the interest rates of these countries fall at or close to zero. Volatility and dispersion have fallen along with interest rates, making it harder for active managers to beat the market. Research by Joe Mezrich at Nomura has identified a link between interest rates, dispersion and the performance of active fund managers. The results of Mezrich’s research are summarized in the Barrons article: A Glimmer of Hope for Active Fund Managers. Nomura strategist Joe Mezrich dug into the most complete set of mutual fund data he could find—the University of Chicago’s Center for Research in Security Prices, which has the performances of every large-company fund including those that shut down along the way, thus avoiding the problem of “survivorship bias”—and what he found was startling: From 1962 through 1981, the median actively managed fund returned nearly 70 percentage points more than the S&P 500 over those 20 years. Unfortunately, the good times didn’t last: From June 1983 to June 2014, the median fund underperformed the market by more than 80 percentage points. … The good news: Dispersion appears to follow interest rates as well, Mezrich says, which could provide active managers with the opportunities they need to beat the market. “The intriguing possibility remains that, once U.S. interest rates revert higher following their 30-year decline, active equity fund managers will track this reversal to better times,” he says. At some point, perhaps in 2015 or even 2016, central banks such as the US Federal Reserve will have to raise interest rates, and when they do, volatility and dispersion will increase. My guess is that the performance of skilled active fund managers will also improve. If that happens, investors that have given up and sacked their active fund manager and replaced them with an index fund may be in for a surprise. * Active share is a measure of “the percentage of the fund’s portfolio that differs from the fund’s benchmark index.” Assuming no leverage or shorting, active share is 0 percent if the fund perfectly mimics the index and 100 percent if the fund is totally different than the index. ** As measured by the cyclically adjusted price earnings ratio, the Q ratio and the price to sales ratio. Market Fox, much of your commentary is derived from equity markets – is it fair to assume that similar comments about active management can apply to other markets (bonds, currencies, alternatives etc) too? Thanks for your comment. Great question. Unfortunately I’m not sure that I can answer it for you. I have focused on equities because it’s an asset class that I know well and because all of the research that I have seen on the effects of volatility and dispersion on active performance has been equity-related. I’m sorry that I can’t be of more help.